Solidago sciaphila is a narrow, regional endemic occurring only in the "Driftless Area" of southeastern Minnesota and adjacent portions of Wisconsin, Iowa, and Illinois. It is considered rare in all four states (Semple and Cook 2006). Although it does not appear in imminent danger of extirpation in Minnesota, there was concern that populations may be in decline. This concern stemed from the accelerating pace of development in southeastern Minnesota; woodland encroachment and the resultant shading of habitat; and the increasing popularity of recreational activities such as rock climbing (Nuzzo 1995). Solidago sciaphila was listed as a special concern species in Minnesota in 1984. Since listing Solidago sciaphila as a special concern species, targeted rare plant surveys conducted by the Minnesota Biological Survey have documented over 75 additional populations, thus revealing that it is more common than once believed to be. 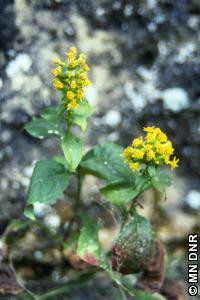 Special concern status is no longer necessary, and Solidago sciaphila was delisted in 2013. Minnesota Department of Natural Resources. 2012. Statement of need and reasonableness. Minnesota Department of Natural Resources. Division of Ecological and Water Resources. St. Paul, Minnesota. 337 pp. Nuzzo, V. A. 1995. Effects of rock climbing on cliff goldenrod (Solidago sciaphila Steele) in northwestern Illinois. American Midland Naturalist 133:229-241. Salamun, P. J. 1963. Preliminary reports on the flora of Wisconsin, No. 50. Compositae III - Composite family. Transactions of the Wisconsin Academy of Science, Arts and Letters 52:353-82.